Anytime Profits Reviews - Legit or Scam? Anytime Profits Reviews – Legit or Scam? Anytime Profits is a new work at home opportunity from spokeswoman Angela Bussio, which claims that anyone can replace their day job and earn thousands of dollars each month with just a few hours of work. This is not the first work at home program that has been promoted by Angela Bussio. She has also previously been linked to Home Profit Masters, Profit Masters Academy, Profit Web System, and Web Fortune Master. The new program that she is promoting is from entrepreneur Kevin Greene, who promises that this opportunity is fully automated and can be used to earn money by even the most inexperienced online workers, all for just one payment of $39.95. According to their video presentation, this work at home program focuses on “evergreen recurring” products. Kevin Greene defines a evergreen products as digital products that never go out of date, and recurring products as online products that create automatic monthly income. The Anytime Profits program promises to give users access to four “up and running” websites in the best evergreen markets that will earn you lump sum and recurring income profits. The website promises that these four websites are operating in the evergreen markets that provide the highest profits, and they are not only completely automated, but they are also updated on a regular basis to make sure they are always working at their highest level. There are many concerns associated with this work at home opportunity. First, Angela Bussio has promoted many other work at home programs which were short lived and very problematic, and to make matters worse, this one is also being promoted by WeeklyMarks.com, a fake news site which has been traditionally linked with unethical opportunities. Another concern are the earnings claims – $7,000 to $8,000 per month with just 15 hours of work per week, and within just five weeks of starting. In addition, the claims that the work is completely automated and done for you by the websites is never a good sign. Finally, consumers who are trying to be responsible and are interested in either contacting their customer service team, looking at their Terms & Conditions, or reading the details of their Refund Policy before ordering will be disappointed. 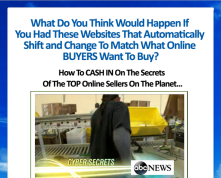 If you try to click on any of these links, you’ll automatically be rerouted to the beginning of their sales video presentation, and there is no way to access this important information. Consumers who are interested in Anytime Profits should consider all these factors carefully before deciding to invest in this program. Average Rating for " Anytime Profits Reviews " is 1 out of 5 based on 1 reviews. I paid the amount for 32$ because of the guarantee that if you are not satisfied you can be fully refunded. A few screens later, to get your websites and stuff, you are charged another 32$. The next day, after asking a few questions are obviously not receiving any kind of answers I asked to be refunded. They sent an email to say they will. They never did and now will not answer any emails. Bunch of crooks. Don't believe it, they will mess u up! !